Hector C. Navasero, former President of Philippine Amateur Baseball Association (PABA) who devoted more than a quarter of century to the sport that he loved passed away at Makati Medical Center on October 1, 2013 due to sepsis, aged 78. A memorial service will be held on October 5, 2013, at the Church Among the Palms, College Laguna. Wearing his distinct yellow vest and taking pictures with his many cameras in every chance he gets, Hector attended all the Congress and Executive meetings of Baseball Federation of Asia, international tournaments and events. Riding on an electric wheelchair, he led Philippine youth team to the IBAF 12U Championship in Taipei in July, 2013. It turned out to be his last public appearance on international baseball scenes. In the early eighties, Hector funded through his company Philab Industries, Inc, a single proprietorship, the training of youth teams in A, AA and AAA categories. After being elected President of PABA in 1986, Hector expanded promotion and development of baseball on the National level and re-joined BFA and IBAF. 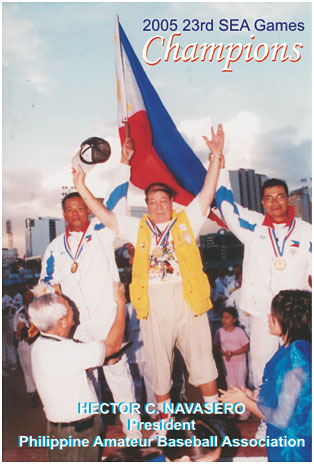 Under his Presidency, PABA hosted the visits of the following teams from other countries: 1993 - Beijing Boys Team from China, Athletes-In-Action from the U.S.A., J.F.K. High School from Guam, 1996 – BFA AAA Championship joined by Korea, Chinese Taipei, Japan, China and Philippines, Pakistan, Mongolia, 1998 – United Micronesia Team from Saipan, 1999 – Selangor Baseball Team from Malaysia, United Micronesia Team from Saipan, 2002 – Palau Major League, 2005 American All-Stars (Chicago White Sox and NY Giants former players), 2009 – KB Baseball Team from Japan, Ehime High School Team from Japan, 2011 – Houtoku Gakuen High School Team from Japan. Further, he funded many baseball and umpire clinics in Philippines. Among his notable accomplishment, Hector helped creation of Asian Baseball Cup, the second tier official tournament of BFA and its gold medalist qualifies to the Asian Baseball Championship. Ever since the first Asian Cup was held in Manila in 1995 participated by Hong Kong, India, Indonesia, Pakistan, Philippines, Sri Lanka and Thailand, the biannual tournament continues in two regional championships to accommodate more number of participants. The West Asia Cup will be held in Lahore, Pakistan in November, 2013 and the East Asia Cup is scheduled in Manila in November, 2014. Hector was again instrumental in the inclusion of baseball in the Southeast Asian Games (SEA Games) of the Olympic Committee of Asia (OCA). In 2012, Hector received BFA’s Presidential Award for his long-term contribution to the promotion and development of baseball in Asia. The international and Philippine baseball community has lost a great friend and long supporter but his legacy will stay with us for many years to come. His son, Tom, who succeeded his father as President of PABA a few months ago, says that his last words were about continuing his support to baseball.